Star Wars fans were simmering with excitement for this winter to come: Star Wars VII: The Force Awakens is hitting the cinemas. The world premiere took place on December 14th in Los Angeles. There were a lot of discussions before, since everything around the movie had been kept a secret. Star Wars VII is a huge news topic at the moment. 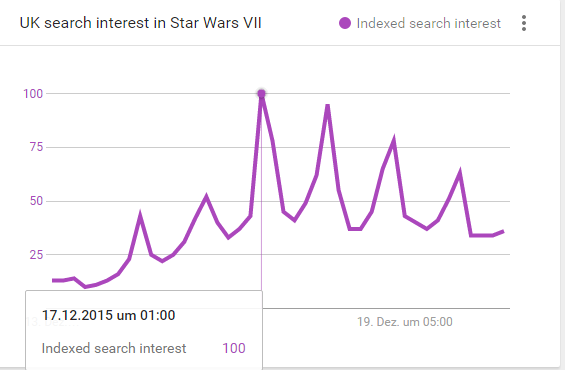 You can also see that in Google Trends: In both Great Britain and the USA the search activities for Star Wars VII are huge, as the following screen shots from Google Trends show. The search activities grew significantly in both countries after the world premiere on December 14th. BBC.co.uk is leading clearly with a visibility of 12.89 percent in the Google News Boxes. Theguardian.com follows with 9.2 percent. Thus, there are no surprises on the first two places – both news players usually have a high visibility in Google News. Then there are three news players that are relatively close together: screenrant.com (6.79 percent), radiotimes.com (5.58 percent), and arstechnica.com (5.47 percent). Screenrant and Radiotimes specialise in movies and television – it is thus not surprising, that those two sites rank in the Google News Boxes for the topic that often. Arstechnica also focuses on movies, technology and science. 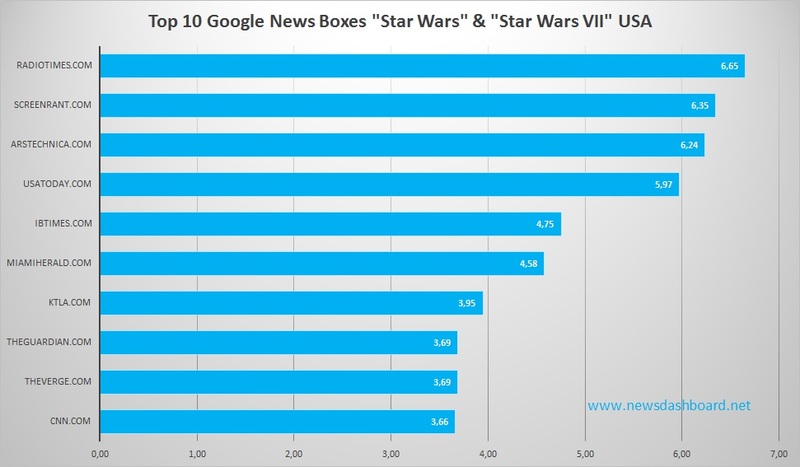 Let us now have a look at the American news players that rank most with the two keywords “Star Wars” and “Star Wars VII”. In the USA, there is no clear winner: the numbers of the single news players are fairly similar. What stands out first is that there is no news player leading with a bigger distance: the single websites are relatively close together when it comes to the Google News Boxes visibility. The fourth position is only 0.68 percent points away from the first place. Places 5 to 10 are also between 3.66 and 4.75 percent. In the UK though, there are two clear winners with the BBC and The Guardian. It also strikes that a few sites are in the top 10 in America and the UK: radiotimes.com, screenrant.com, artechnica.com, ibtimes.co.uk resp. ibtimes.com, ktla.com, theguardian.com and theverge.com. The numbers also level around a similar area. 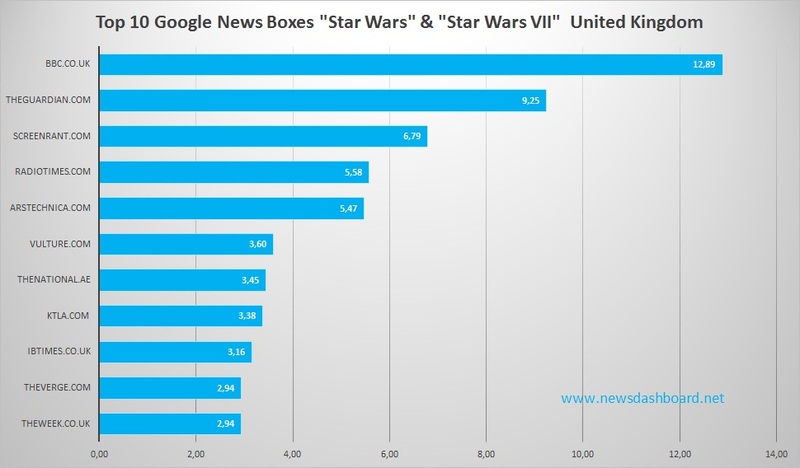 Screenrant for example has a visibility of 6.79 percent in the Google News Boxes in the UK – in the US they rank with 6.35 percent. The only difference: in the UK this number only reaches the 3rd place, in the US screenrant.com is on the 2nd place. 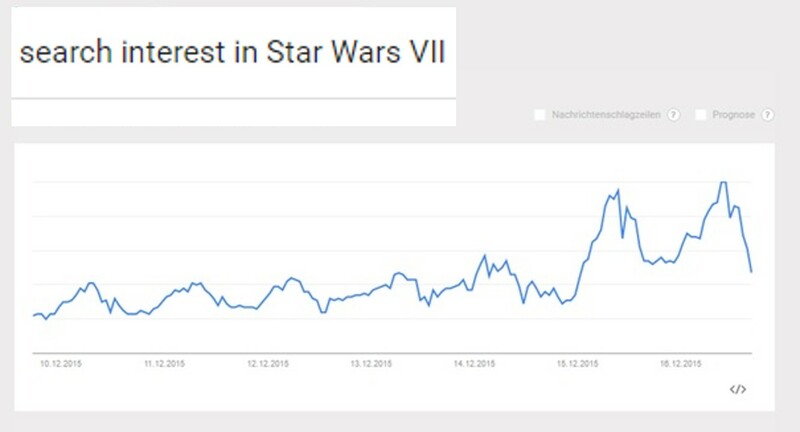 Radiotimes.com is a bit more successful in the US when it comes to the keywords “Star Wars” and “Star Wars VII”: the news player is leading here with 6.65 percent – in the UK they are on the 4th place with 5.58 percent.